Mardome Reflex are a range of wonderfully designed dome roof lights that utilise Longlife polycarbonate to provide the utmost strength and security. Mardome reflex roof lights are glazing only units, which are ideal for projects where it is only the glazing that needs to be replaced. The polycarbonate used in these dome roof lights is 200 times stronger than glass. This makes them highly resistant to breakage and adverse weather conditions, therefore making them ideal for almost any flat roofing application. 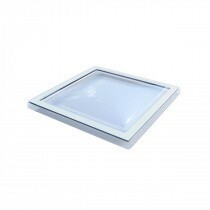 These dome roof lights are also available in both dome and pyramid options, with each providing their own benefits. If you have questions about our range of Mardome Reflex roof lights, simply call our team on 01295 565565. We will help you select the best dome roof light for your project and make huge savings through our price match promise. What’s more, with fast delivery across the UK you’ll be able to get started with your project quickly.